Cosy, real log lodges nestle in the sprawling country estate with its ornamental lake, romantic tower ruin and impressive mews building. 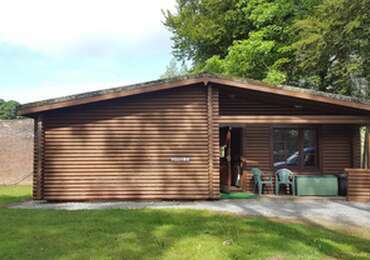 The resort's 25 self-catering holiday lodges are the ideal place for families and couples to spend time together while exploring Carmarthenshire's many delights, from beaches, gardens and waterfalls, to castles, outdoor pursuits and market towns. The tranquillity of the resort's setting is the perfect retreat for relaxation, adventure and fun. The self-catering resort has a fabulous leisure complex within the old walled gardens and the magnificent mews building houses a welcoming coffee shop and the Coach House restaurant. 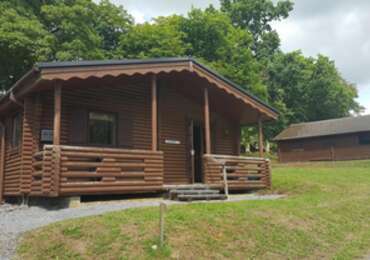 Set within the beautiful woodland grounds, warmth and charm are captivated inside each lodge offering couples, families and groups from 2-8 people the perfect short break or longer self-catering holiday in Wales. Each log cabin features a well-equipped modern kitchen and bath / shower rooms. Many also feature wood-burning stoves for those cooler autumn-winter evenings. 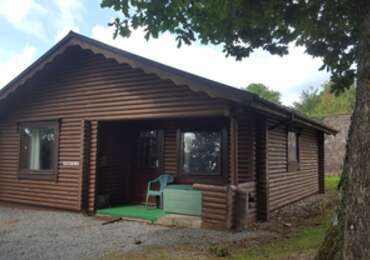 Beautiful two-bedroom lodge offering one double bedroom with ensuite shower and one twin room with family bathroom. The double sofa bed in the lounge provides additional accommodation. The open-plan lounge, kitchen, dining area offers a log burning stove, flat screen TV with Freeview and DVD player and a fully equipped kitchen with microwave, dishwasher and fridge/freezer. Linen, towels and electricity is included in your stay. Coal, logs and kindling for the multi-fuel stove is not provided, but can be ordered.